His Highness Sheikh Mohamed bin Zayed welcomed the Grand Imam of Al Azhar Al Sharif in his second country … reports Asian Lite News. His Eminence Dr Ahmad Al Tayyeb, Grand Imam of Al Azhar Al Sharif, arrived today in the UAE on a three-day visit. He was received at the Presidential Flight by His Highness Sheikh Mohamed bin Zayed Al Nahyan, Crown Prince of Abu Dhabi and Deputy Supreme Commander of the UAE Armed Forces. His Highness Sheikh Mohamed bin Zayed welcomed the Grand Imam of Al Azhar Al Sharif in his second country. He also expressed his wishes for a fruitful meeting with His Holiness Pope Francis Head of Catholic Church and stressed the meeting of the two key religious icons in Abu Dhabi is a message of coexistance and peace among peoples to build a future based on mutual respect and cooperation to safeguard a shining future for the coming generation. Sheikh Mohamed indicated that the UAE recognises that coexistence among all mankind of all races, nationalities and religions is the only way to promote world peace, thus, the noble principles on which the UAE was established, the issued laws and regulations, and the positive spirit prevailing in the country are key factors that have made the UAE a magnet for living and working for more than 200 countries worldwide. The Grand Imam of Al Azhar was received by H.H. Sheikh Hamdan bin Zayed Al Nahyan, Ruler’s Representative in Al Dhafra Region; Dr. Amal Abdullah Al Qubaisi, Speaker of Federal National Council, FNC; H.H. Sheikh Tahnoun bin Mohammed Al Nahyan, Abu Dhabi Ruler’s Representative in Al Ain Region; H.H. Sheikh Saif bin Mohammed Al Nahyan; H.H. Suroor bin Mohammed Al Nahyan; H.H. Sheikh Hazza bin Zayed Al Nahyan, Deputy Chairman of Abu Dhabi Executive Council; H.H. Lt. General Sheikh Saif bin Zayed Al Nahyan, Deputy Prime Minister and Minister of the Interior; H.H. Sheikh Tahnoun bin Zayed Al Nahyan, National Security Adviser; H.H. Sheikh Mansour bin Zayed Al Nahyan, Deputy Prime Minister and Minister of Presidential Affairs; H.H. Sheikh Hamed bin Zayed Al Nahyan, Chief of the Abu Dhabi Crown Prince’s Court; H.H. Sheikh Abdullah bin Zayed Al Nahyan, Minister of Foreign Affairs and International Cooperation; Sheikh Nahyan bin Mubarak Al Nahyan, Minister of Tolerance; Sheikh Dhiab bin Tahnoun Al Nahyan; Noura bint Mohammed Al Kaabi, Minister of Culture and Knowledge Development; Zaki Nusseibeh, Minister of State, and Ali Saeed Matar Al Neyadi, Chairman of the Federal Customs Authority. During his visit, His Eminence will be participating in the overall Human Fraternity Meeting with His Holiness Pope Francis, head of the Catholic Church and also taking part in the International Conference for Human Fraternity that is attracting 700 multi-faith representatives from around the world. Both religious leaders accepted the invitation of His Highness Sheikh Mohammed bin Zayed Al Nahyan, Crown Prince of Abu Dhabi and Deputy Supreme Commander of the UAE Armed Forces, to attend the UAE’s Human Fraternity Meeting. They will also visit together the Sheikh Zayed Grand Mosque and the Pontiff will also meet with the Muslim Council of Elders that has His Eminence the Grand Imam as Chairman. 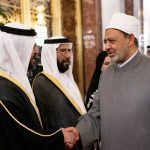 The Grand Imam of Al Azhar Al Sharif was accompanied by Dr. Nasr Farid Wasel, Dr. Abdel Hadi Mohamed Abdel Hadi Zare, Dr. Mohamed El-Mahrsawy and Dr. Ata Ata Sayed Ahmed, Dr. Abdullah Sarhan, Dr. Abdel Moneim Fouad, Dr. Mustafa Abdel Ghani and Dr. Nazih Abdel Maqsoud as well as other officials.